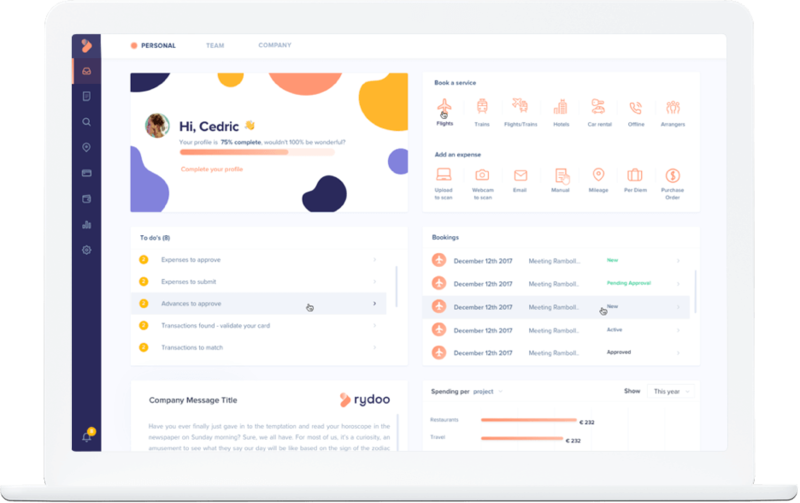 There’s a lot to organise while working in recruitment, and at Rydoo we understand that keeping track of expenses can be a frustrating and time-consuming experience. Our travel and expense management systems promise to change the way you work and to cut admin times by up to 75%. Rydoo offers a fully automated and paperless platform, all you need is a smartphone. You can just snap a picture of the receipt, submit and wait for approval. We take care of the rest. We understand that every company operates differently, so we’ve left the power to customise your experience in the way that makes the most sense to your recruitment company. Simply enter your existing expense policies and we make sure that all submitted receipts are compliant. The best part is, Rydoo offers real-time insights into your company spending habits, providing companywide transparency and giving you back control over your expenses. Why not see for yourself with our 14-day free trial? "The OCR technology was the best we had encountered and the product is being continually updated and improved." Find out more. What are the main advantages you have by using Xpenditure? "It saves time inputting expenses, has a great approval flow that can be customised, spots duplicate expenses, automates expense rules to name but a few.. In summary it saves time and money and ensures expense policies are followed and expenses are paid in a timely manner." Find out more. "Gives me peace of mind that the expense procedure is under control. It saves the business time and money." "Warmly received as it saves all departments time."